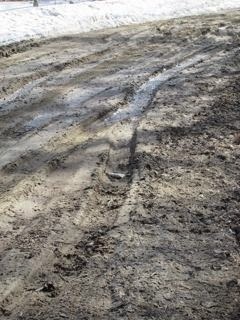 This is what the town road/Jungle Lane looks like today after driving in and out six times over the last two days. 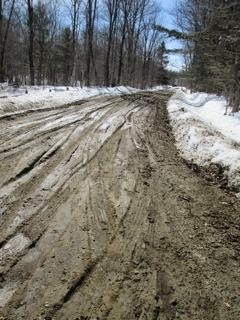 This is a town-maintained road which really hasn't been maintained other than plowing in the winter for the last twelve years or so. At that point I did get my Ford wagon stuck in the mud up over the door frame and the town hauled in some rocks and more sand and they dug out the ditch deeper. Every year since it has been sort of muddy but never anything like this. 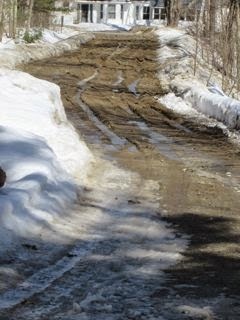 The ruts today are 8-12" deep in places. Maybe if the road wasn't all sand it wouldn't be this bad. I do worry about getting a firetruck or ambulance in/out of here if it were necessary. And with plowable snow predicted for this weekend, I wonder what will happen with the town plow and our own driveway plow guy.